Before there was the human walrus in 2014’s Walrus [I feel so sorry for Justin Long), there was the HUMAN JELLYFISH. Yes, it’s as stupid as it sounds. Thankfully, the director only lets the audience see bits and pieces of the killer jellyfish man until the final scene. When the monster is fully revealed, the result is laugh-out-loud funny. 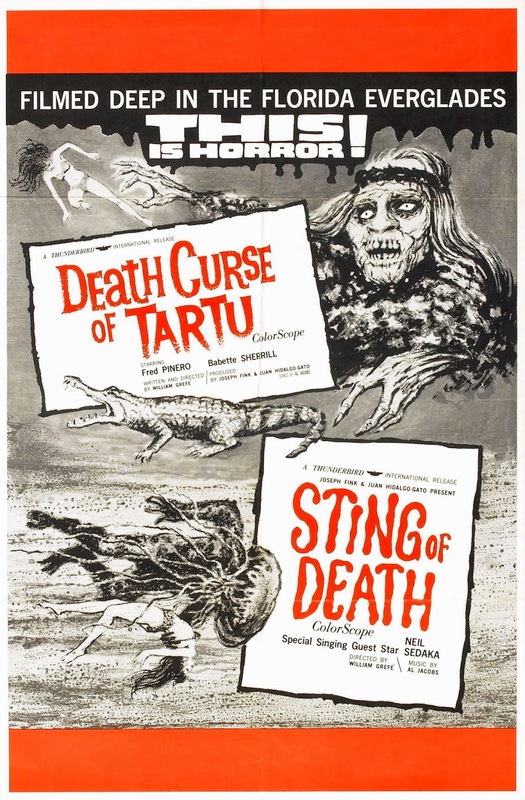 While Sting of Death is definitely grade Z horror, it still has it merits. The underwater photography, done in the Florida Everglades, is very good and quite beautiful. The acting is also better than one would expect. However, the endless go-go dancing for no apparent reason gets on your nerves [unless you like that kind of thing]. And the kill scenes, while they show a little blood, are anything but terrifying. Apparently, director William Geffe never saw any Argento or Bava films from this era of he would have upped his game a bit. I know this kind of movie has it’s audience but, for me, it fails to fall into the “so bad it’s good category.” I can’t say it’s the worst film I’ve ever seen, but I don't feel the need to see it again. Perhaps Sting of Death is best seen with a group of friends and a twelve pack. With so many great films out there, I hardly think this one is worth your time. Trust me on this one.